The World’s largest, state-of-the-art, educational, professional, informative, and integrated knowledge base dedicated to the health, maintenance, and future of the web of life on planet Earth, focusing on sustainable development in all its myriad aspects from ecological issues to human security! The EOLSS is the result of an unprecedented global effort and a decade of planning. The leading experts who have contributed to this state-of-the-art publication come from diverse fields. Peer reviewed body of state-of-the-art archival knowledge edited by over 395 subject experts with contributions from over 8000 reputed authors from more than 100 countries. The content covers more than 235 major theme subjects as an integrated compendium of 20 component encyclopedias. AREA STUDIES (REGIONAL SUSTAINABLE DEVELOPMENT REVIEWS):Brazil, China, Japan, USA and Canada, Europe, Russia. Through the many and diverse consultation exercises around the world, the EOLSS has benefited immensely from the academic, intellectual, and scholarly advice of each and every member of the nearly 1000-strong International Editorial Council, which includes Nobel and UN Kalinga Laureates, World Food Prize Laureates and several fellows of academies of science and engineering of countries throughout the world. EOLSS was officially released on the Internet at (www.eolss.net) by the UNESCO Director General on the 3rd September 2002 during the World Summit on Sustainable Development in Johannesburg, South Africa. It attempts to forge pathways between disciplines in order to show their interdependence and helps foster the transdisciplinary aspects of the relationship between nature and human society. It deals in detail with interdisciplinary subjects, but it is also disciplinary as each major core subject is covered in great depth, by world experts. The Encyclopedia is designed to be a guide and reference for a wide range of users: from natural and social scientists to engineers, economists, educators, university students and professors, conservationists, entrepreneurs, law and policy-makers. 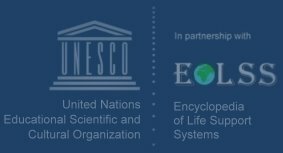 The EOLSS project is coordinated by the UNESCO-EOLSS Joint Committee. Best efforts are being made to make the EOLSS widely accessible to the global public and this effort is widely admired for espousing education for sustainable development. “EOLSS has the goal to provide a firm knowledge base for future activities to prolong the lifetime of the human race in a hospitable environment”, according to Richard R. Ernst, Nobel Laureate in Chemistry. “Most United Nations projects of this size begin by consulting government representatives. But EOLSS went straight to the scientific communities involved,” said Andras Szollosi-Nagy,a member of the UNESCO-EOLSS Joint Committee and Director of UNESCO’s International Hydrological Programme. In 1996 thousands of scientists, engineers and policy-makers began meeting just to define the scope of the project, before discussing the details of the contributions. Regional workshops were held in Washington DC, Tokyo, Moscow, Mexico City, Beijing, Panama, Abu Sultan (Egypt), and Kuala Lumpur to develop a list of possible subjects and debate analytical approaches for treating them. Teams of experts are working to regularly update the various sections of the web-based encyclopedia, making EOLSS a “living virtual library and a site for action rather than just a publication,” according to Mustafa El Tayeb, Director, Division for Science Policy and Sustainable Development (SC/PSD), UNESCO and Secretary of the UNESCO-EOLSS Joint Committee. Soon, it will mature to its full size of about 70 million words (equivalent to about 200 volumes) by augmentation and updating as often as every month. EOLSS is rapidly becoming the most sought after reference site in the World.